St. Kitts is located in the mid-Leeward Islands 50 miles S.S.E. of St. Martin and 200 miles S.E. of Puerto Rico. The 41,000 inhabitants on the 68 square mile island enjoy an average yearly temperature of 83î with a constant easterly breeze. After years of French then England rule, St.Kitts, with her smaller sister island of Nevis, became a British Territory in 1783. Independent since 1983 in conjunction with Nevis, the Federation is a member of the British Commonwealth and the United Nations. The new nation is a stable Parliamentary Democracy and itís government has shown considerable wisdom in policy and cooperation with foreign sources of capital investment and development. Real estate development has flourished as a result of a growing expatriate community. Ross Veterinary University, with more than 500 students and faculty is a vibrant member of this community and the Island. Tourism is a growth industry as evidenced by several new hotel projects. The Island boasts of a well maintained professional 18 hole golf course. Although the Island maintains its charm and relaxed pace, it is a modern emerging nation which is ready for the 21 st century i.e. fiber optic telephone system, internet access, cable TV, totally resurfaced main roads, recently renovated electrical distribution, excellent water supply system, business friendly banking and financial services, new airport facility, and an educational system aimed at providing a skilled work force. 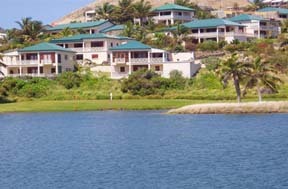 Add to these features the natural beauty and peacefulness of the Island and you have the finest "Jewel of the Caribbean"